Ultimate Cofounder Membership – Limited Time Offer! Unique Opportunity! Only 25 Subscriptions Allowed – Click to Know More! This is not just an e-book. It is part of a comprehensive system of interactive programs that offer advanced training in some of the most essential successful living skills for the 21st Century. It is also a “co-creative process” designed to continuously evolve over time through input and participation by readers like you. Awakening to our spiritual identity; Realizing more of our potential; Harnessing our creative mind power; Flowing our energy to solutions rather than problems; Remembering who we really are and why we are here; Fulfilling our life purposes and missions; Making a difference and leaving a legacy; Loving, serving and blessing others; Maintaining a positive mental attitude; and Applying creative thinking and problem-solving. What to expect from this book and the entire program? This book, like the others in the Ultimate Destiny Success System Library, provides the self-discovery exercises, the tools, the stories, self-assessment quizzes, journal space, and insights that encourage people to dream and then to put those dreams into motion. This book features content from some of the world’s best-known resource providers in this area; some of them have earned the Ultimate Destiny Hall of Fame Award for their dedication and innovation. In the Empowerment Journal section of this book, you will be encouraged to answer questions about what this piece of the ultimate destiny success puzzle means to you: What do I want in this area? What don’t I want? What is the ultimate possibility? How will I feel when I have all that I want? How can I nurture my heart’s desires? What priority goals will I set? You will be asked to think deeply so that you can assess the hurdles and obstacles to be overcome. You will learn how to tap into the dynamics of creative imagination, the law of attraction, the power of intention, and spiritual visioning to help create and manifest an enriched life. Then you will be offered a variety of support methods—such as creating a personal vision board, writing affirmations, identifying teachers and coaches, and joining a mastermind team—geared to anchor your dreams until they become realities. We invite your “co-creative” input. This publication is evolving, and we invite your creative participation in its never-ending evolution. We believe that gathering and sharing resources from readers like you, including your own experiences in this area, will help others realize more of their potential for ultimate success. We also invite you to help us identify additional resources—including articles, stories, quizzes, self-assessment exercises, books, audio video programs, live events, web sites, affiliate programs, and more—that will help anyone who is interested in Enjoying Loving Relationships. And we’d like you to help us identify and acknowledge those authors, trainers, and visionaries who deserve the Ultimate Destiny Hall of Fame Award. This honor is awarded to someone who is living his or her ultimate destiny while helping others fulfill their destinies in this key area of successful living. This e-book is only one part of our efforts to help you realize more of WHO YOU ARE. We also have interactive quizzes, introductory articles, insightful self-discovery exercises, application and implementation tools, featured resources, and a blog site where we are co-creating communities of like-minded and like-hearted individuals who care about each successful living skill. And we will publish a print book that includes some of the best ideas and suggestions we receive from readers like you. At Ultimate Destiny University, we offer seminars, teleseminars, webinars, workshops, playshops, weekend retreats, coaching and mentoring, “training-of-trainers” programs, licensing opportunities and “earn while you learn” affiliate programs. We also offer fundraising programs for non-profit organizations that can earn 50% to 100% of the sale of any of the e-books in the Ultimate Destiny Success System Library to their members and supporters. Our Ultimate Fundraising Programs make it easy for non-profit groups to raise the funding they need. What is your ultimate destiny, and how may we help you fulfill it? Have you (or someone you know) written a book or developed a seminar or workshop that will be valuable to others interested in enjoying loving relationships? Do you have a story to share on this topic? We’d like to hear about it. Would you (or someone you know) be interested in earning an income while helping others realize more of their potential? Do you know of a non-profit organization that would like to help each reader realize their life’s purpose and co-create their ultimate destiny, while raising needed funds? We’d like to hear from you. Would you like to discover the advantages of having a successful living coach and mentor—or would you like to become a successful living coach? If your answer is YES! (or even maybe) to any of these questions, let us know. 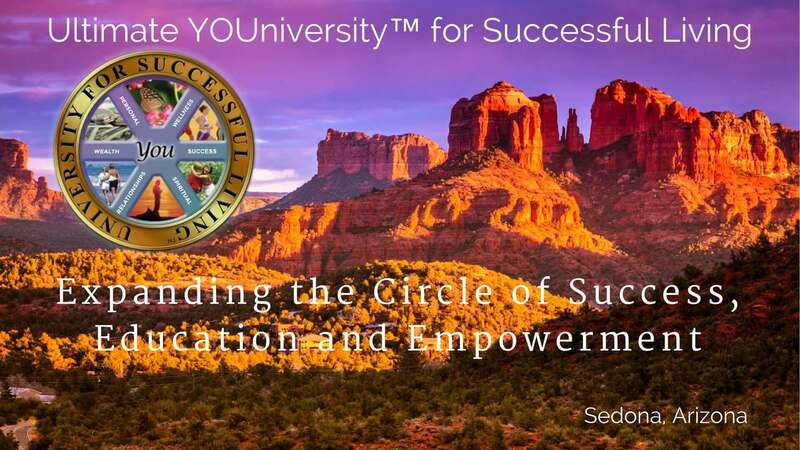 Email us at ultimatedestinyuniversity@gmail.com or write to Ultimate Destiny University, PO Box 20072, Sedona, AZ 86341. Thank you for making the investment of time, energy and money to read this publication. Ultimate Destiny University’s mission is to help you realize more of your potential, fulfill more of your life’s purpose, and discover and fulfill your ultimate destiny, whatever it may be. On the last few pages of this publication, you’ll find an introduction to Ultimate Destinyland™ and several ways you might benefit by participating. We invite you to join us and become a co-creator of Ultimate Destiny Land. To help ensure the Ultimate Success of our University for Successful Living launch, we are seeking up to 25 initial Cofounding Charter Members. Anyone who joins us as a Diamond, Platinum, or Ultimate Charter Member while this offer is available will receive all of the usual Membership Benefits, a 1 Year 100% Money Back Guarantee PLUS Cofounders shares equal to your membership tuition in our affiliated Collaborative Infopreneurship Network Benefit Corporation.